Forget The Beatles, in the betting world there’s only one Fab Four and that’s the guys we’re about to talk about. By playing and winning more than most people will ever see in their lifetime, our quartet of famous gamblers really are the rock stars of their world. Of course, we’re not suggesting you try to follow in their footsteps. However, if you’re looking to bring down the house in your own small way, these guys could teach you a thing or to. So, with that in mind, let’s take a look at four of the most famous American gamblers through the years. For sheer tenacity and ingenuity, Amarillo Slim is without question the best gambler of all time. 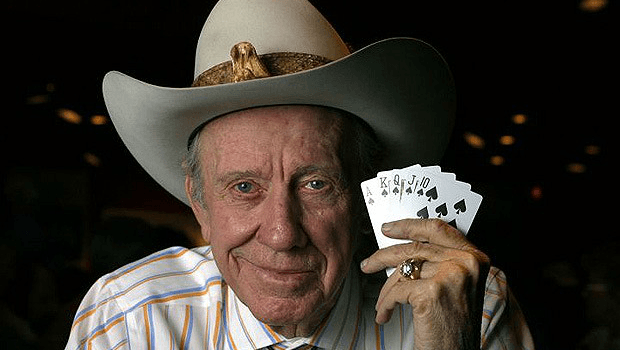 Originally a poker player from Texas who joined forces with Doyle Brunson and Puggy Pearson, Slim eventually became the most famous pro bettor in the world. Even though he never lost touch with his poker roots, it was his exploits away from the felt that caught the mainstream media’s attention. For example, when he said he could beat a racehorse in a 100-yard dash, everyone thought he was crazy. However, what people didn’t account for was the rules Slim thought up. Instead of running in a straight line, the race was 50 yards in one direction and 50 yards in the other. The end result was a victory for the dry-witted, canny gambler. This type of thinking was common across all of Slim’s bets. Whether it was beating a pool champion using a broom handle or table tennis pro with Coke bottles, Slim was a master bettor and one the likes of we’ll probably never see again. He died in Amarillo, Texas, aged 83 in 2012. If ever there were a rags to riches story in the betting world, Archie Karas would be it. Arriving in the US from Kefalonia, Greece, Anargyros Nicholas Karabourniotis had only $50 in his pocket when he went to Las Vegas in 1992. However, within a span of two years, he turned that into more than $40 million. Admittedly, Karas did receive $10,000 to kickstart his run, but what transpired was beyond everyone’s wildest expectations. Through a combination of high-stakes poker, blackjack, roulette and baccarat, Karas won more in two years than probably anyone in history. Unfortunately, his dance with lucky luck came to a disappointing end. As quickly as he amassed his fortune, he lost it all. However, the ride to the top was certainly an unforgettable one for the 67-year-old. Many people who enjoy some form of sport believe they can make a profit betting on their interest. In reality, however, sports betting is a skill. Although the average punter can get lucky on a hunch, the real pros will analyse stats, assess the betting lines and do everything in their power to find a positive EV scenario. Billy Walters is someone who has mastered these skills better than almost anyone in history. Walters started his betting career at the age of nine when he used his paper round money to bet on the 1955 World Series. However, in later years his bets would continue to increase until he was wagering millions every week. As well as his own skills, Walters would employ a team of maths experts and industry insiders to help him place thousands of bets each year. In fact, such was Walters' power that he could move the betting lines each time he made a bet on account. For that reason alone, Walters is a US gambling legend. Now aged 71, he's currently in prison, serving five years for masterminding an insider-trading scheme. In recent years, poker pro Phil Ivey has emerged as a worthy sidekick for Slim, Karas and Walters. As well as being the best poker player in the world, Ivey famously won more than $20 million during two baccarat sessions. Even though legal issues with casinos in London and Atlantic City eventually erased his win, no one can deny he’s a force in the casino world. Perhaps the main reason Ivey, 41, is a gambling legend in the making is his ability to spot the weaknesses in a game. Much like he can look at an opponent in poker game and find their faults, Ivey can do the same in the betting world. Whether it’s an issue with the cards that gives him an advantage or a sports bet where the odds are slightly out of line, Ivey can always find an edge. Because of this, he’s more than worthy of sitting alongside our US gambling legends.